Tapa/Kapa or bark cloth was the fabric for clothing and bedding in Old Hawaii. We use the word Tapa instead of Kapa because to our present day elders, Kapa means quilt. It is made from the inner bark of the Wauke(Paper mulberry plant) or Po'ulu (young breadfruit saplings). To make Kapa took much skill and hard work. Due to this and the introduction of woven fabrics Kapa makers ceased to make their product and good Kapa was not made in Hawaii for almost a period of a hundred years. Through our present research and experiments we have revived this art. At present there are many young Kanaka Maoli native Hawaiian Tapa makers that are doing beautiful work. We were one of the several pioneers in reviving this art in the early 80s, Malia Solomon, Pua Van Dorpe, Dennis Keawe, Carla Freitas and others were instumental in this endeavor. The late Dr.Beatrice Krauss of the Lyon's Arboretum and the late Siapo Master artist Mary J. Pritchard of American Samoa were two of my greatest mentors. But most of all we give all the credit to the Lord Jesus Christ, I remember back in 1979 experimenting with making Tapa and asking the Lord, "Will you show me how the Kupuna of Old made those beautiful Tapa"? All that I have learned was given by divine inspiration and countless hours of work & research in the Bishop Museum Collections. 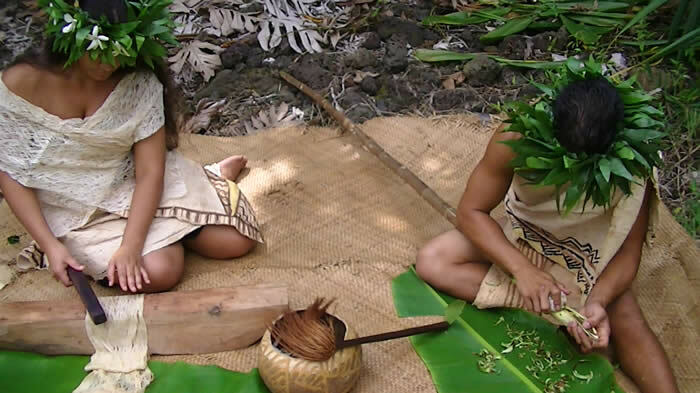 As younger Hawaiians desire to experience the legacy that was left by their ancient ancestors, we are reminded by the song Na Ali'i, Ua pau, ua hala lakou, no koe no na pua, they (ancestors) have all past away and done with their work, now remains their descendants to carry it on. As the Baibala Hemolele says, Old things are passing away and all things are continuing to become new. May we allow the Aloha of Makualani to change the lives of all those we share Tapa making with. Ho'onani ia Ka Makualani, a me Keiki Hiwahiwa, a me Ka Uhane Hemolele, Amene. At the present, we are growing wauke from the shoots of parent plants known to be the native variety grown here in Hawaii from Makapala, Kohala . In searching for Wauke plants we have found two varieties that are mentioned in various resources. One variety has three lobed leaves and the other has ovate leaves. According to Kalokuokamaile of Napoopoo, Kona, Hawaii, Wauke and Poaaha were different. Wauke had fingered leaves (lau manamana) and Poaaha had round leaves (lau poepoe). Each had its use depending on the type of Kapa to be made. Wauke must be planted in a well watered area. Some areas on Oahu were noted for being good for cultivating Wauke such as Kualoa on the windward‑side of Oahu and Moanalua Gardens area of Honolulu . We cultivate Wauke in Kona, Kohala and in Honolulu.